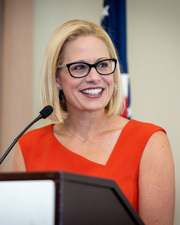 SINEMA, Kyrsten, a Senator and a Representative from Arizona; born in Tucson, Pima County, Ariz., July 12, 1976; B.A., Brigham Young University, Provo, Utah; M.S., Arizona State University, Tempe, Ariz., 1999; J.D., Arizona State University, Tempe, Ariz., 2004; Ph.D., Arizona State University, Tempe, Ariz., 2012; social worker; lawyer, private practice; adjunct professor; unsuccessful candidate for election to the Arizona state house of representatives in 2002; member of the Arizona state house of representatives, 2004-2010; member of the Arizona state senate, 2010-2012; elected as a Democrat to the One Hundred Thirteenth and to the two succeeding Congresses (January 3, 2013-January 3, 2019); was not a candidate for reelection to the House of Representatives but was elected as a Democrat to the United States Senate in 2018 for the term ending January 3, 2025. Sinema, Kyrsten. Unite and Conquer: How to Build Coalitions That Win and Last. Oakland, CA: Berrett-Koehler Publishers, 2009. ___. Who Must Die in Rwanda's Genocide? : The State of Exception Realized. Lanham, MD: Lexington Books, 2015.